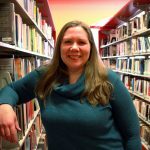 Laura Irmscher is Chief of Collections at the Boston Public Library, overseeing all collections at the library, encompassing general circulating, research, digital, and special collections. Laura began her career as a reference librarian before moving in to collections. She holds a Master’s Degree in Library and Information Science from Simmons College.